Some questions boil down to "how can/do I do X?" Here's an example. Sometimes, people leave comments under such questions that ask "what have you tried?" Is it OK to leave comments like that? Should all questions contain snippets of non-working code? It's perfectly OK to ask the OP to inform us of what they have attempted so far to solve their problem, in a polite, constructive way. So many people were asking "What have you tried?" without any useful elaboration about what information would be helpful, that it was becoming rude. As of March 2013 that comment has been outright blocked. Please can you show the specific piece of code that's not working. Please explain what you mean by "not working". You should always be polite - remember the rule "be nice". We're trying to "make the Internet a better place" here. In this case it's better to be a little more verbose than you might want to be as it can help to explain just exactly what information you think is missing. However, it should be pointed out that if you need to add any (or all) of these comments then that's the mark of a bad question. Leaving these comments is hopefully the first step on getting a good question that people can answer. If there's no effort to improve the post then it's the mark of a question that can be closed. Well in my experience what have you tried? comments quite frequently seem to be a synonym of bad luck. In my understanding, What have you tried or my default response (Please share your effort) does not only point to code. 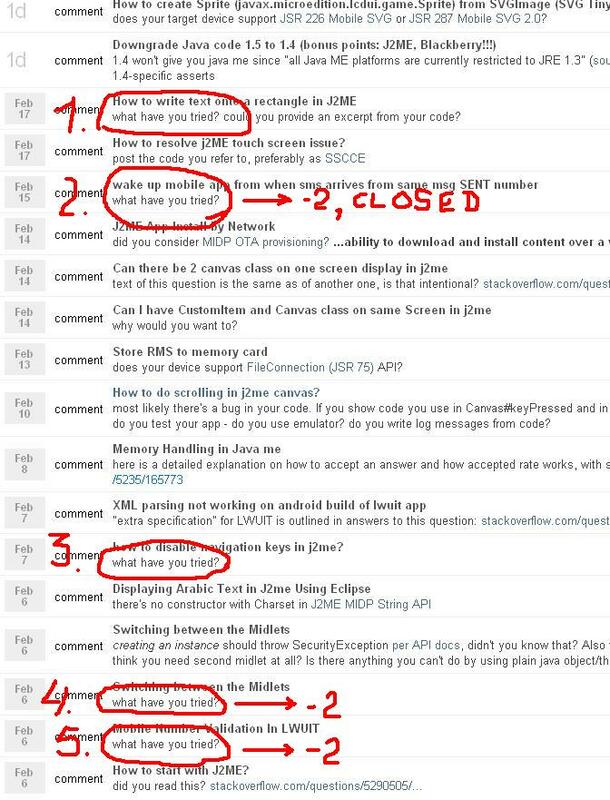 Yes code is very important, but these comments mean have you put in any effort regarding the problem? Broke problem into smaller problem statements and solve them individually. List names and marks of Maths and English of all students who have scored more than 70%. Get necessary details of every student. You have partial scope and you can try links on filtering list of objects and fetching values from an object. Now if you share link for both problems saying I have found this link for a and this link for b, but how to use them together, this shows you have tried something. Yes, there is a possibility that your search query was not good enough, but sharing this information will show users, your sincerity and they will not only help you with proper solution but also help you to improve your query. Sharing efforts also tell user a lot about user who is asking and based on this, answer will be different. For a beginner, you will make answer more descriptive but for a well framed specific question, answer to that area will suffice. Yes there are cases where you have no idea where to even start searching. For such cases, mentioning this in question will also help users as they know OP is a beginner and is not aware of terminology specific to technology and will frame answer accordingly. So all in all, I believe its valid to ask for efforts, but as mentioned in community answer, you should use proper tone. providing a complete answer to the problem would be too broad unless the poster narrows the scope by indicating what they have done already. But those are valid close reasons. The question as it stands is off topic. Instead of adding a comment, vote to close the question,, and move on. Not the answer you're looking for? Browse other questions tagged discussion stack-overflow asking-questions etiquette . Is “What have you tried” considered as an appropriate comment?